This Monkey Bread King Cake recipe is a great way to learn how to make monkey bread all while celebrating the upcoming Mardi Gras Season! Easily made with Pillsbury rolls, you cannot go wrong topping with green, purple and gold frosting and tearing off delicious bites of cinnamon sweet bread. 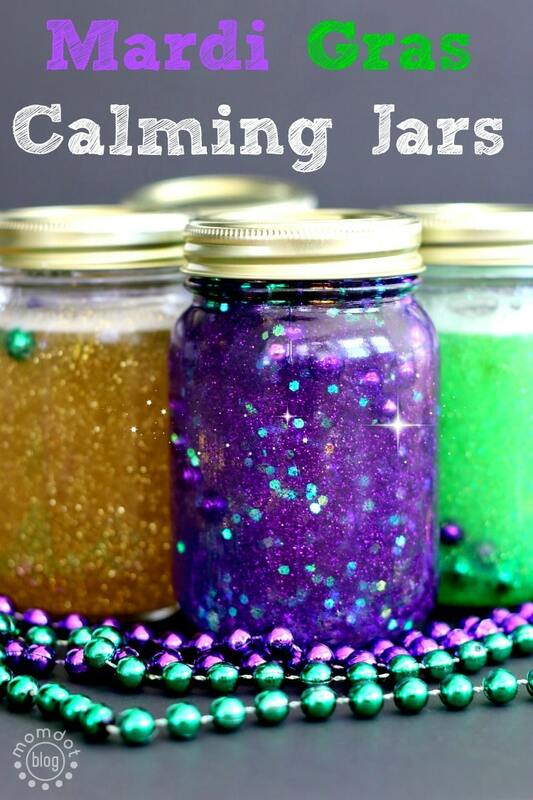 This week it’s Mardi Gras y’all and we are about to make some homemade king cake. Now you do not have to live in the south to enjoy this delicious treat and it’s very fun to make and more fun to eat. Before anyone else that lives in the south goes off on me that this is not a “traditional” King cake, you are right. 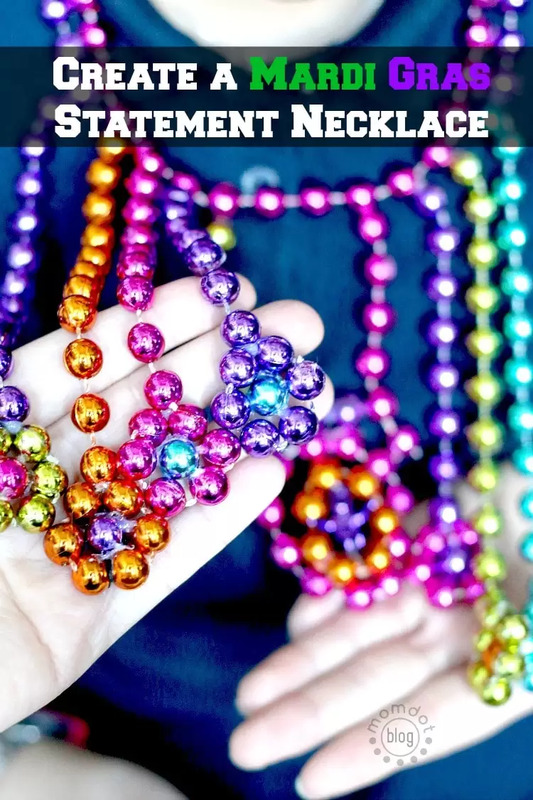 Traditional king cake is not cut up into monkey bread bites, nor does it have colored frosting. It has a white frosting and colored SUGAR but truth be told, I wanted to make something a little more festive and colored frosting is just that. If you would still rather decorate yours with white icing and tri-colored sugar, have at it. The sweeter, the better! You can also fill your King cake with anything from pecans and caramel to raspberries and cream. There are also a ton of ways to enjoy sweet cinnamon king cake and if you are in New Orleans, I suggest trying them all. But for the rest of us that have a moms kitchen and need a quick dessert recipe, here is an easy fix it for whipping up your own homemade version in under 30 that the whole family can enjoy. TIP: Before you get started, make sure you have a QUALITY bundt cake pan . I love this one (and use it as you can see) by Wilton. Its no stick, which is super important with monkey bread, and holds its shape. And at this price, you cannot afford NOT to have one in your kitchen. While this recipe is about Mardi Gras, you could easily replace the icing to include Valentines, St. Patrick’s Day, pretty much ANY holiday. Plus this is the same pan used in the hidden image cakes! If you attempt to make this in most other pans, it won’t come out of the pan! BURN ALERT! Want to watch instead of read? See my simple King Cake Video! This monkey bread recipe is so simple that even your kids can help! Simply open up your cinnamon rolls and cut into 6 pieces (or 4 if you want larger bites). I cut mine down the middle first and then vertical two more times, which leaves me with 6 pieces. Do this for both cinnamon roll containers. Cinnamon is a classic flavor for king cake, but if you prefer another flavor, its your house! Place your cut up rolls into a gallon size zip lock bag. Dump 1/3 cup sugar and mix up. Now place your pieces into a bundt cake pan (sprayed with no stick spray first) until level all the way around. Place in oven on 350 for approximately 22 minutes. Please note that this varies depending on your oven and depth of pan, so I put mine on 10 minutes and added 5 minutes at a time till I was ready to pull out. Once cooled about 5 minutes, dump on cake plate. Melt down your frosting in a bowl, about 20 seconds, and add food coloring. I then poured mine into a little jar that allowed me to squeeze on the frosting in stripes. You don’t have to do that, but it’s fun. Now cut into a slice, put on plate and place a baby UNDER one piece. 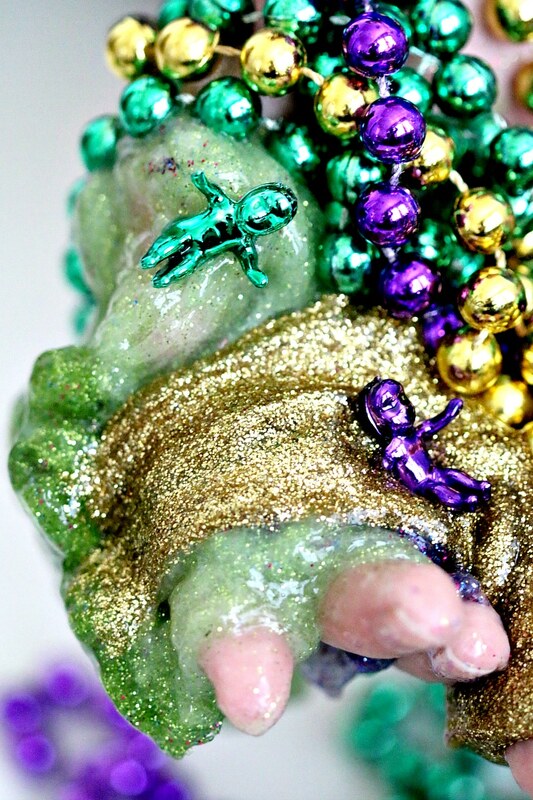 This way is probably the most easy king cake recipe on the planet! Have everyone look under the piece prior to eating and whomever has the baby has to make the cake next year! Do not bake the baby in the piece because it’s a choking hazard. Feel free to add extra frosting to your king cake! This recipe is so simple that even your kids can help! Simply open up your cinnamon rolls and cut into 6 pieces (or 4 if you want larger bites). I cut mine down the middle first and then vertical two more times, which leaves me with 6 pieces. Do this for both cinnamon roll containers. Place your cut up rolls into a gallon size zip lock bag. Dump 1/3 cup sugar and mix up. Place in oven on 350 for approximately 22 minutes. Please note that this varies depending on your oven and depth of pan, so I put mine on 10 minutes and added 5 minutes at a time till I was ready to pull out. Melt down your frosting in a bowl, about 20 seconds, and add food coloring. I then poured mine into a little jar that allowed me to squeeze on the frosting in stripes. You don't have to do that, but it's fun. Now cut into a slice, put on plate and place a baby UNDER one piece. Have everyone look under the piece prior to eating and whomever has the baby has to make the cake next year! Do not bake the baby in the piece because it's a choking hazard. 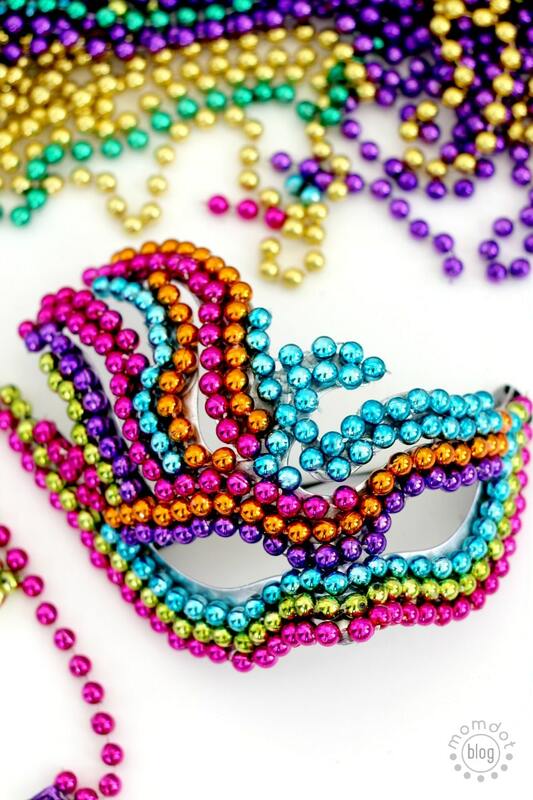 Love Mardi Gras? Check these out before you go! Just click on one of the four images to be taken to that post!